Some people are not excited about all the hearts and love for Valentine's Day, but I think everyone can agree on chocolate! (well most anyways) The following is a reading lesson used with my Tier 3 fifth graders. 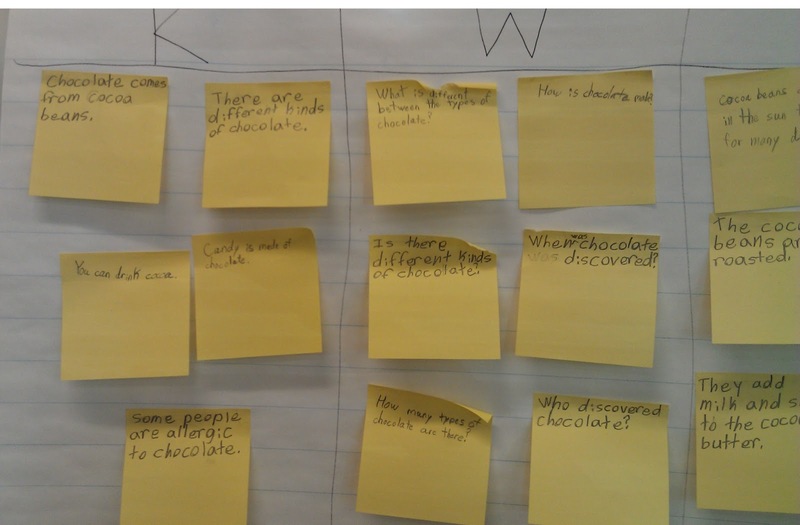 To begin, we completed a KWL chart about what we already knew about chocolate. Surprisingly, we found out that we did not know that much about chocolate. We also recorded several questions we had about chocolate. Then I read aloud the book From Cocoa Bean to Chocolate. This is a great book that gives an overview of the chocolate making process in very simple language. As we read the book, we stopped to add information to the "L" section of our KWL. 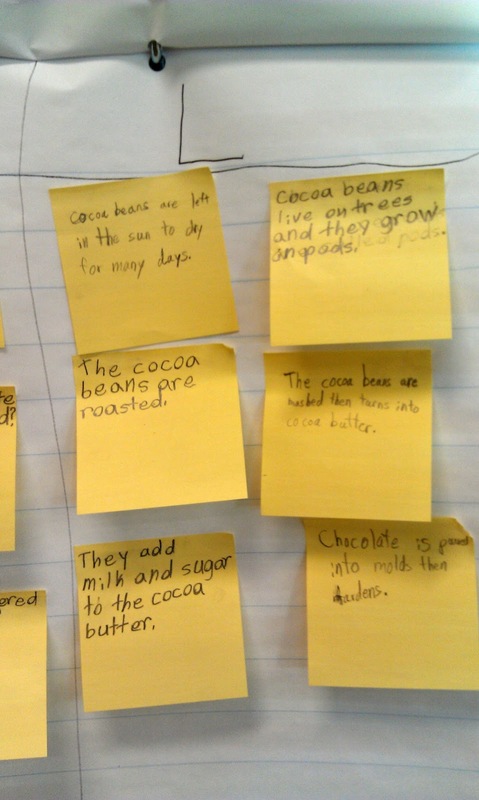 Once we had a basic understanding of the chocolate-making process, students read the Scholastic Superscience article Cheers for Chocolate. (If you have an ebsco host login, you can click on the link for a copy.) This article continues to elaborate on the chocolate-making process in great detail. 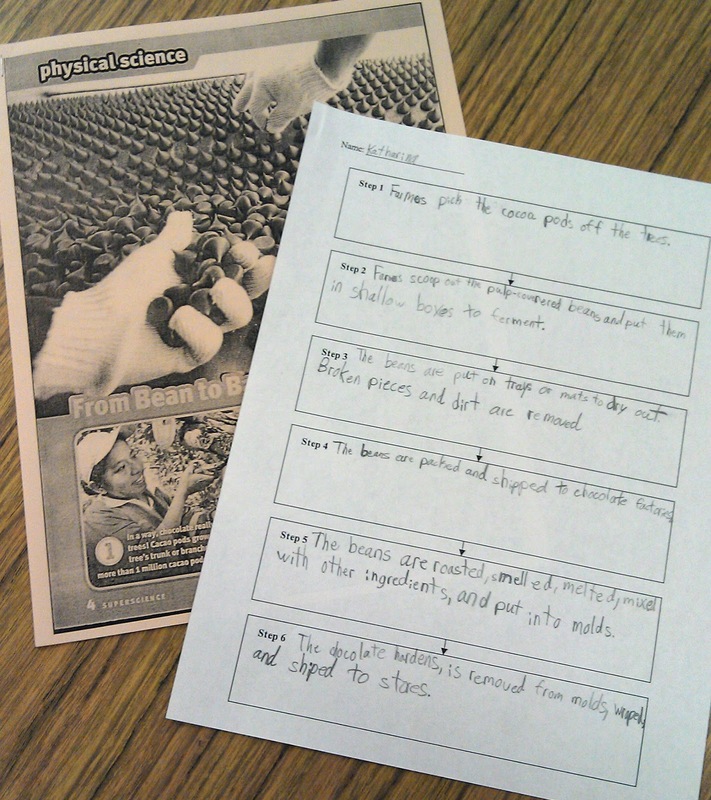 For this article, we completed a sequencing graphic organizer on the steps of the chocolate-making process. We also continued to add information to the "L" section of our KWL chart. For a copy of the blank graphic organizer, click on the image below. One particular question students were curious about was the difference between the types of chocolate. For this reason, I created the article below. You can get a copy of the article by clicking on the image. We had to have a taste test to verify what we learned of course. The variety pack of Lindt chocolates pictured below just happens to include white chocolate, milk chocolate, and dark chocolate. 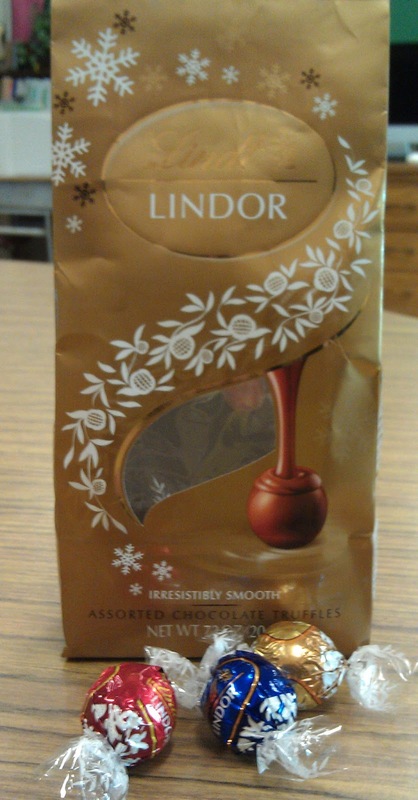 Interestingly enough, the dark chocolate was the favorite. We also continued to add information to our KWL chart. Once we knew about the different types of chocolate, we had a better understanding of just how much sugar can be in some chocolate. 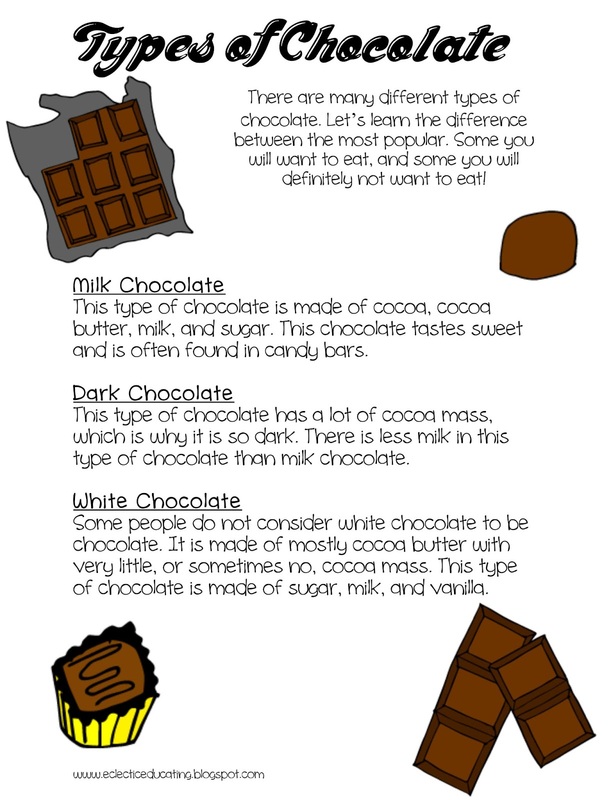 With this information, we started talking about whether chocolate was good or bad for you. Throughout our readings, we had learned that there were some health benefits to certain types of chocolate, but consuming too much sugar was a problem. 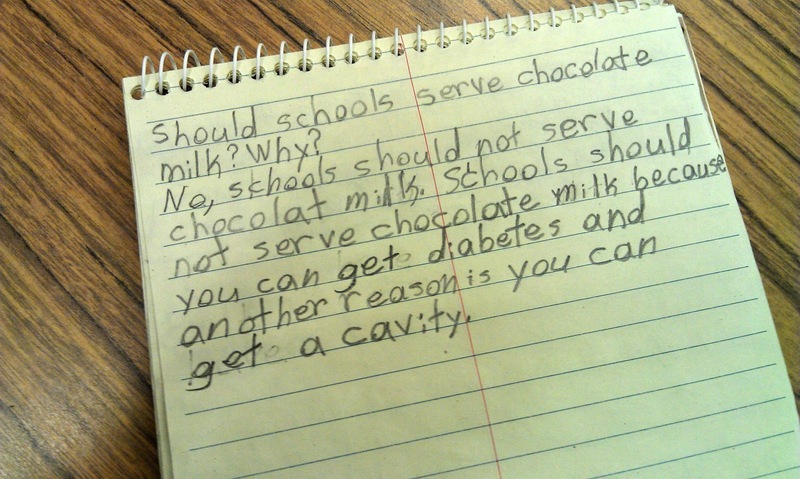 So I asked students, what about chocolate milk? Is that good or bad for you? There was some disagreement on this issue. To help settle the debate, we read a short article from Scholastic News titled Is Chocolate Milk Junk Food? (If you have an ebsco host login, you can click on the link for a copy.) 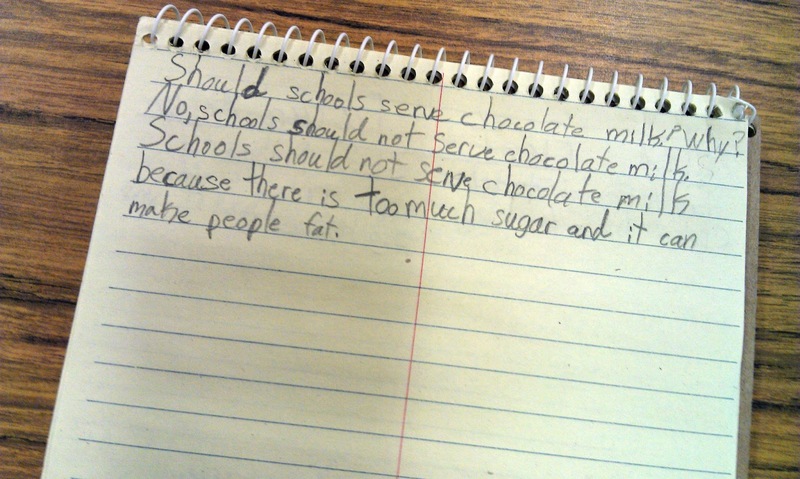 Then students wrote in their journals whether or not they thought schools should serve chocolate milk. They had to provide support for their opinion. The students did a really nice job with their written responses. I was surprised how many of them were against schools serving chocolate milk. I hope you found something useful in this lesson. What kind of chocolate is your favorite? I am a white chocolate fan myself. I love this lesson! I never thought of using Ebsco Host to download articles, but what a great idea. I especially love the cross-curricular aspect of it. Sign me up for your class! Thank you for the great ideas! I do have some articles about chocolate that I could easily use but I will have to check out Ebsco host. What fun!! I loved reading about all of your 'sweet' activities. The kids written responses were fabulous. I love when the kids are really into a lesson, it makes learning easier for everyone! I'm happy to have found you and am even happier to be your newest follower! Thanks for sharing your great ideas!